Sara Barnes thought everything was totally under control. All she had to worry about was her final exams, Christmas shopping, applying to medical school – and the cute freshman in the next dorm with a crush on her. 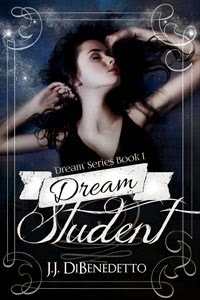 Everything was going according to plan, until she started seeing other people’s dreams. It’s bad enough that Sara is watching her friends’ most secret fantasies whether she wants to or not. Much worse are the other dreams, featuring a strange man who commits unspeakable crimes. Now Sara wonders if she’s the only witness to a serial killer – and the only one who knows where he’s going to strike next. The truth is, unless I’m completely wrong about him we’re going to go upstairs sooner or later anyway. It’s just a question of when if it doesn’t happen tonight. But right at this moment, what I decide feels so important. This is going to sound totally ridiculous, but it feels like something out of a movie. You know what I mean, that moment when the music softens and the romantic leads are in the spotlight and everything else is forgotten; the whole world stops except for them. Maybe it’s only my imagination or maybe I’ve got an overly developed sense of the dramatic–a few days ago I would have said it’s definitely that. But it isn’t. It’s not just my imagination. It’s real. It’s exactly what’s happening right now. I don’t know why it’s so important–no, that’s not true. I do know. It’s important because it’s exactly what I want and need right now, and maybe I’m lying to myself about love at first sight and everything else. Maybe I’m just using him to distract myself from the nightmares and not sleeping right, maybe–well, maybe a lot of things. You know what? I don’t care about maybes, and I don’t care about motives and I don’t care about anything else except that he’s here right now. He’s looking at me, waiting for me to decide. Everything else is silent, frozen. The snowflakes are hanging in midair; the whole world is waiting for my answer. No pressure, though. No pressure at all. Yes or no? Nothing else matters except what I decide. You're welcome, James. Here's to many sales.